Don't cry. Come Sunday, the Dr Pepper will be flowing like November Rain. When Chinese Democracy finally goes on sale, the soft-drink maker is making good on its promise of free soda for everyone in America. 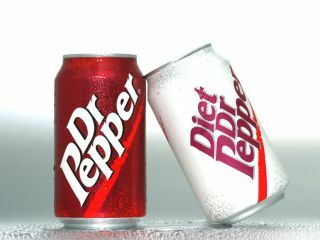 Back in March, the Dr Pepper people said they would offer free fizzy stuff if Axl dropped his infamously delayed Guns N' Roses album in 2008. Back then, the likelihood of seeing Chinese Democracy on the shelves seemed remote. But now that day of reckoning is upon us, and according to the Associated Press, the drinks company isn't welching. Obtaining one's free can of Dr Pepper has to be done in a timely fashion. Beginning this Sunday (23 November) at 12.01am, coupons for a free 20-ounce soda will be available for 24 hours on Dr Pepper's website. That's it - 24 hours. If you're late, no Pepper for you. Coupons will be honored until 28 February 2009. What about Slash and Buckethead? Interestingly, when the offer was first announced, guitarist Slash and Buckethead would not be eligible for free soda. Later it was said that Buckethead could cash in since his playing appears on Chinese Democracy. In the statement just released, no mention is made of either guitarist. Slash, ol' buddy, we'll slide you some. No problem.